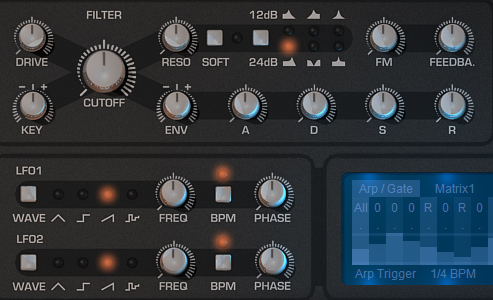 Saurus 2.5 brings the highly regarded analog sound from the past into the unlimited digital realm, fusing them together with a user interface that invites to tweak and a multitude of unique sound sculpting tools exclusive to Saurus. All without placing heavy demands on your CPU or budget. 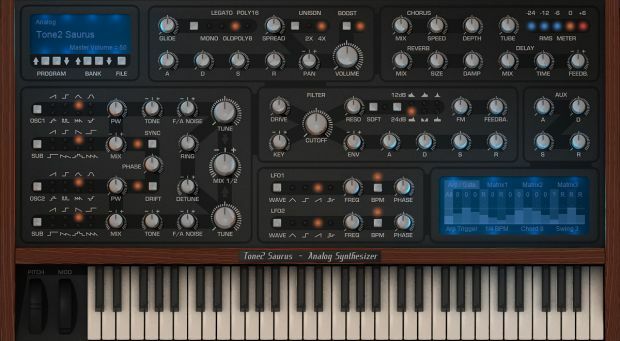 It has been the aim of developers the world over to bring the best “Virtual Analog” synths possible to re-create the sound of classic hardware. However, unlike many competitors who sell “Virtual Analog Synthesizers” which are at best mere approximations of what happens in the real world, we set out to create not just another synthesizer with character, but one that truly represents the sound of analog hardware. We carefully measured and modeled the circuits of many classic performance synthesizers, even including single capacitors and resistors to provide an extremely accurate analog model, faithfully capturing the spirit and character of these old machines. True analog sound with state of the art features! 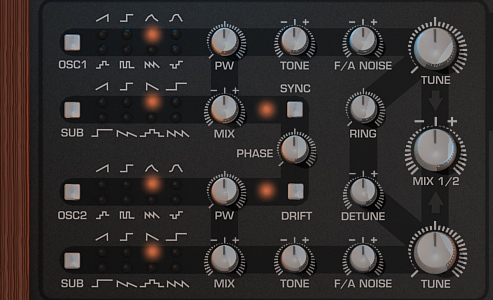 Saurus2.5 can do an extremely authentic emulation of analog synthesizers. It covers all important aspects of the most famous and expensive analog synths, but without their disadvantages. Saurus2.5 comes with a clear, easy to use interface. 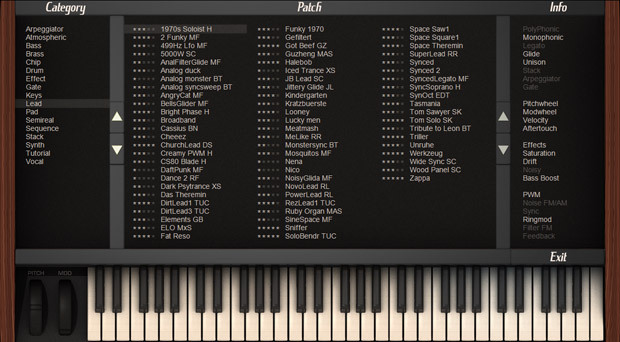 It offers a larger sonic range and a more flexibe synthesis engine than conventional substractive synths. Saurus2.5 offers quality high-end sound, but without placing heavy demands on your CPU or budget. At the heart of Saurus are its top notch oscillators employing our True Analog Modeling Technology ™, which produces a warm characteristic sound of the hardware units from the past. With PWM, Sync, AM & FM an extremely broad range of sounds can be dialed-in. 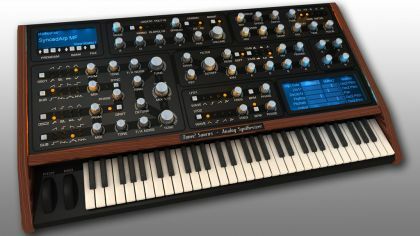 Saurus offers a selection of both standard and exotic oscillator types from hard-to-get analog synths. Finally true analog sound no longer requires any compromises! No analog sound would be complete without an excellent filter that’s capable of sounding both lush when needed or screaming when over driven. Analog-esque filters are far from perfect. They suffer from distortion, noise, phase shift and self-oscillation, but it is exactly these imperfections that gives them more character than their sterile sounding digital counterparts. This is the reason why Saurus comes with a filter section modeled after a variety of the most famous analog filters, with precisely modeled non-linearity and self-oscillation to make them sound every bit as full of character as its core sound. To top it all off its filter section also includes FM, feedback and an analog modeled distortion for that little extra grit. By using drag & drop or the matrix, Saurus allows you to connect dozens of modulation sources to sound parameters. Modulate almost any parameter up into the audio-rate speed. We’ve also included midi-learn, so assigning CC’s is as simple as a right-click. 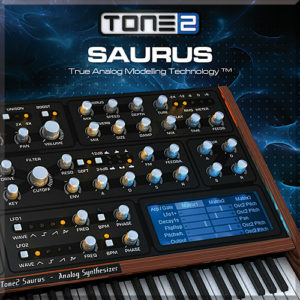 To compliment its sound, Saurus features various classic effects such as 4x unison, chorus, delay, reverb and tube amp. All are of the usual high standard. We created an arpeggiator that doesn’t just offer the basic note step functionality. It takes the concept further by adding features such as custom patterns, chords, swing and per step velocity. This ensures your arpeggio sequence can be as simple or complicated as you wish. You may need to pay a lot to get true analog quality sound, opt to use hardware with its many disadvantages or need an extremely powerful processor to cope with the demands of software. Once again, enter Saurus: Finally true analog sound no longer requires expensive hardware, even in full stereo unison, full polyphony or at maximum settings. Very few synthesizers that have analog themes can claim they have such little demand let alone broad sound, letting Saurus stand tall.